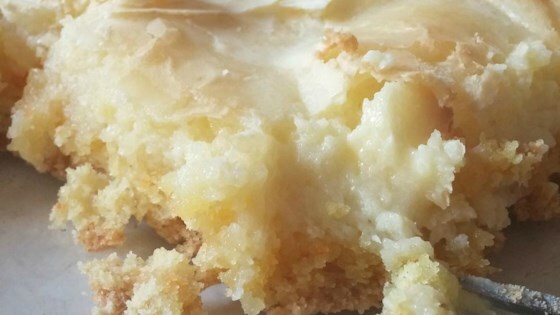 "Chewy Butter Cake using yellow cake mix and cream cheese. Cut into bars when cooled." In a large bowl, combine cake mix, margarine, 1 egg and 2 teaspoons vanilla. Press into a 9x13 inch pan. Using the same bowl, combine cream cheese, 2 eggs, 2 teaspoons vanilla and 4 cups confectioners' sugar. Mix together until smooth. Pour over cake mixture. Bake in the preheated oven for 35 to 40 minutes. Cake will rise up around sides of pan and look fallen when done. Allow to cool. This was pretty good although it was more like a brownie than cake. Be sure to let this cool COMPLETELY before cutting or it appears to be gooey. Otherwise, it's great!!! Enjoy! Rich and gooey and YUMMY! I made this for my husband at work. He said everyone loved it. I substituted chocolate cake for yellow and added milk chocolate chips. My husband LOVED this! It's very good. It's fun to try different flavor combinations with this one! This recipe is so easy to make and an excellent desert to bring to a potluck or social gathering. Very yummy, forget about dieting! We werent crazy about it ... maybe I did something wrong. It was ok, just not great. I think I would enjoy it more with a chocolate mix.. or maybe lemon? ?